Home News Aruna river sadness. Tirupati, Jan 9 (way2newstv.in):Tirupati Aruna River is disappearing. Akkars are interested in sand in the river. The river is located near the town of Gooluru, near Puttur. 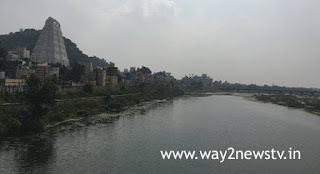 The river is about 15,000 acres of water in Puthur, Narayana, Nandra and Pichatur mandals. 40 kilometers of water flow to the nearby Aariyar Project near Pichadur. River yore is very high during the rainy season. The river is in the area where large streams, ponds and canals are injected into the river. he river, which is 100 meters wide in the past, now shrinks to about 20 meters. In the last part, it is about 50 meters wide. The Aruna River now has the largest number of sand miners. All the areas in the river are destroyed by sand making some sand. Chennai, Puthur and Srikalahasti. The tractor sand is sold at Rs 2,000 to Rs 2,500. Acknowledging the difference between day and night Nearly half of the sand in the river, the big stone is now visible in the riverbank. The amalgam of the river in the river is now on the banks of the river. There are also sandy soils where the fields are also dug. The 10 meters depth is made of tractors. Hundreds of acres inside the Aranyakandirika, Tummur, Narayanavanam, Koppendu and Palamangalam villages come under very much sand. They are attacking the victims. If you have sand in front of their eyes ... villagers are excited to do nothing. Hundreds of acres are becoming deserted. The wells in the river ... they are motivated by their motors and their enthusiasm to pump water through pipes. The sand is full of stones, so the stones do not come out of the water. Thus, farmers have been hard at harvesting. They were selected from Ottawa, a native of Coppola. As young teams formed sand in the area where they are found in the four zones. The people of the area move the sand on the Aruna River and move the sand. The banners are being strictly overwhelmed by tearing sand to government programs for tractors when the attacks of officers are increasing. When the authorities are waiting, they are raiding the landowners and losing too much. The colp area is the government sand reich. But no one goes there. There is no place for sand in the river ... There is not a sandalwood sand in the Reich area. The mad plants in the area are the worst.